Local stamps for the Czechoslovakian town of Rumburk were produced shortly after its liberation and the Allied occupation in April 1945. This former Sudetenland town of Rumburg, Rumburk in Czech, is situated on the northern edge of Bohemia, and it shares a border crossing with the nearby German town of Seifhennersdorf in Saxony. In late 1944 and early 1945, as various towns in the former Protectorate of Bohemia and Moravia and in the Slovak Republic were liberated, many localities overprinted available postage stamps for provisional usage in order to continue their postal services. Images of Hitler were to be obliterated, and most of these issues were only authorized for postal use until the end of May 1945. Whether privately produced or issued on the authority of local committees, over 400 overprints of different types and from different locations in Czechoslovakia are known. 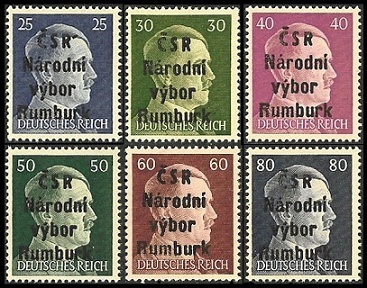 The fourteen Third Reich Adolph Hitler definitives shown above were overprinted for use in Rumburk. 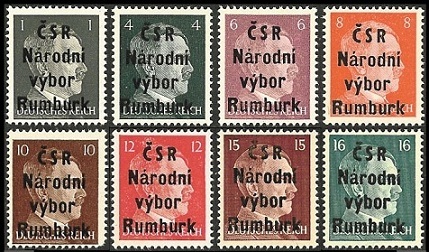 The overprint reads ČSR / Národní / výbor / Rumburk which translates to Czechoslovak Republic (1945-1960) / National / committee / Rumburk. A provisional Czechoslovak government had been formed on April 4, 1945. As the liberation progressed National committees took over the administration of towns, as the ethnic German populations were expelled. More than 4,800 committees were formed between 1944 and the end of World War II, under the supervision of the Soviet Army. By the end of May 1945, Czechoslovakia had been completely liberated, and the Czechoslovak Republic was re-established. Later in the year, all allied forces were withdrawn from Czechoslovakia.